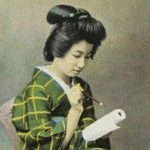 Guests have often asked, “Where can I see geisha in Kanazawa?” Although Kanazawa’s mysterious “Women of Art” share their titles with Kyoto’s—geisha are called geiko here and throughout West Japan—they are considerably shyer with their presence. 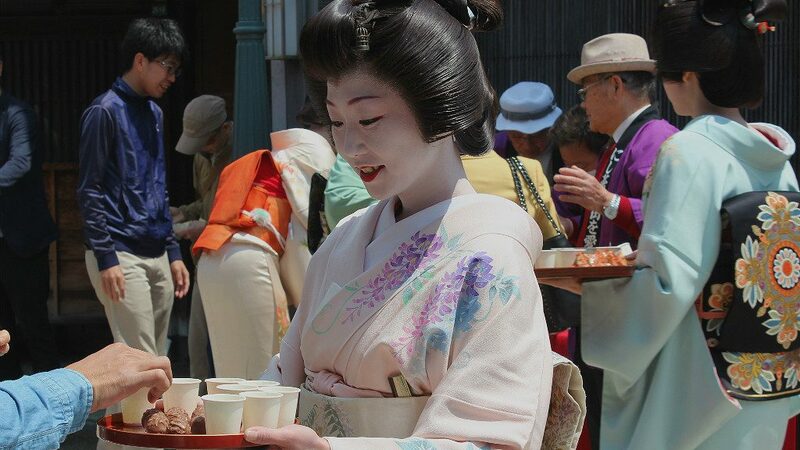 If you’ve passed through the tea districts during daylight hours, you very likely may have heard and seen (though out of makeup) geiko out and about. 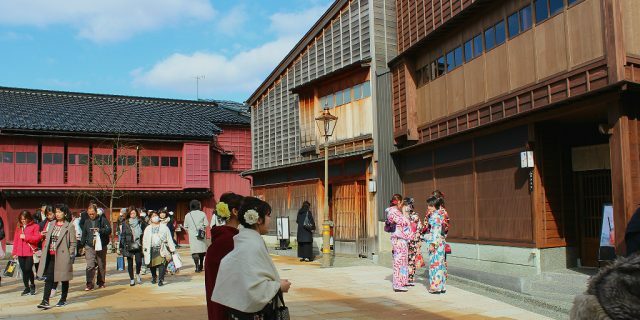 With their natural hair done up more simply, and adorning traditional kimono and yukata, Kanazawa’s geiko make their way to the training centers, where outsiders can hear them practice shamisen, taiko and singing. 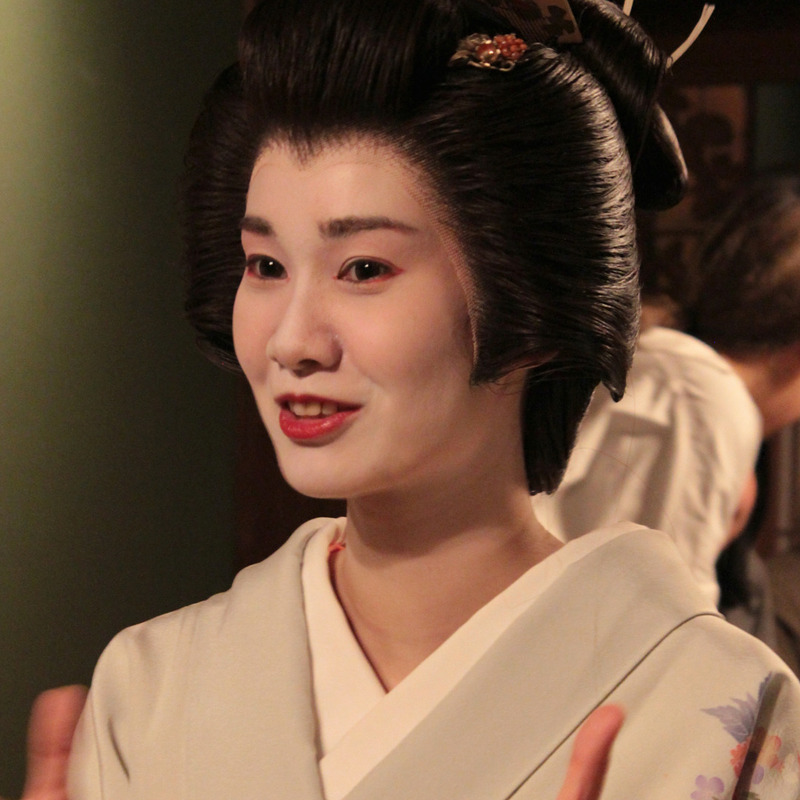 One of the newest editions to Kanazawa’s geisha performance events is that put on by In Kanazawa House, a traditional dye shop that now hosts limited-seating cultural events. 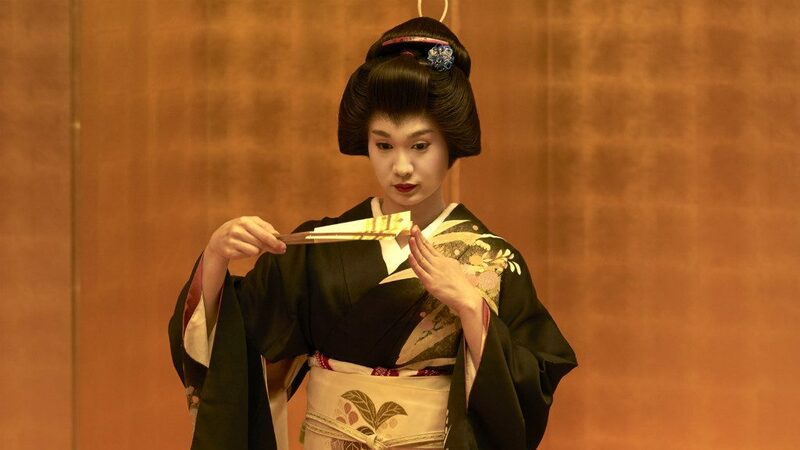 Their “Geisha (Geigi) Performance & Dance Experience” is considerably pricier than others below, but the cost covers a kaiseki-style meal of local cuisine, including drinks. Most importantly, it covers translation assistance while getting to speak face-to-face with the geiko at your table. 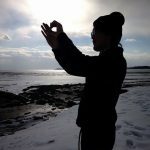 Advance reservation and payment by credit card or PayPal is required. The current schedule can be found on their official website. As the venue is still starting up with this and its cooking event, check back frequently for future updates. 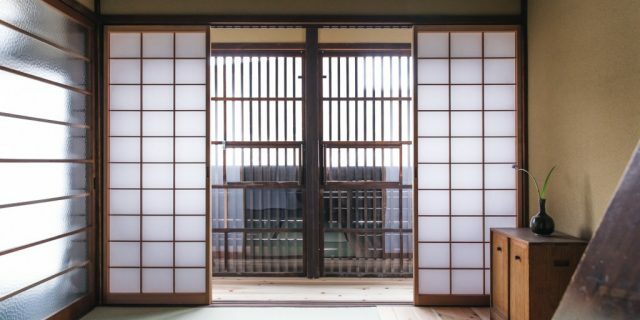 At Kaikaro Tea House in Higashi Chaya, a living museum by day, working tea house at night, special “Geisha Evenings” are available to the public in late March to mid April, and October to early November. The host is the gregarious Lady Baba, proprietor of the tea house. 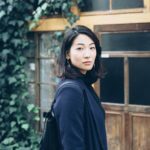 She provides an introduction into the house and geiko culture, dance, taiko and photography sessions, and all entirely in English. 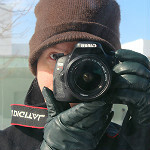 Reserving tickets in advance online grants a small discount. Same day tickets are possible at the full price, pending availability. 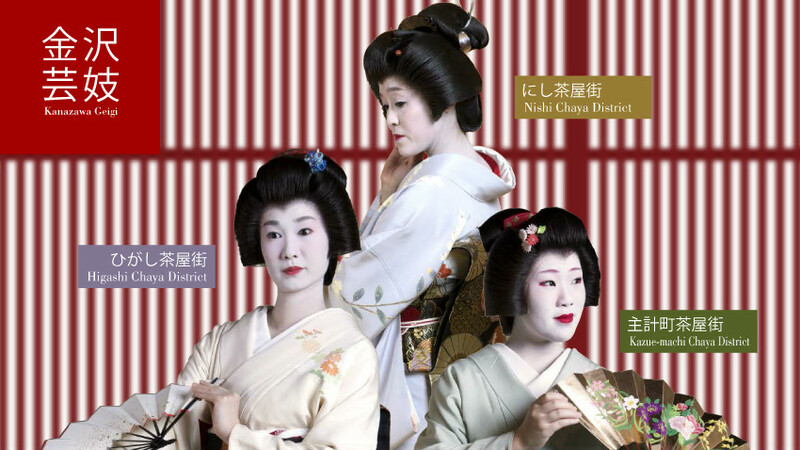 Its lengthy Japanese title translates to “A Journey that Touches the True Art of Kanazawa Geisha.” These events are affordable group experiences with real geiko in all three districts. 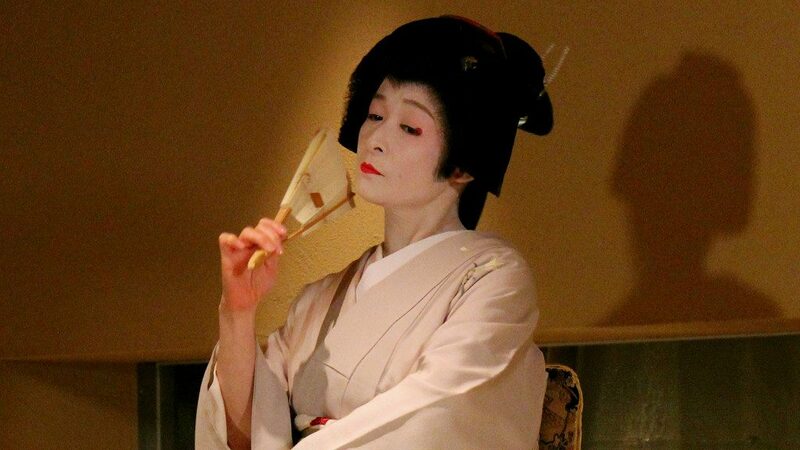 During select Saturdays in June and from September to March, guests of the public can enjoy a geiko experience in the early afternoon. The event includes a Japanese explanation of the tea house, dance, taiko drumming, game, and tea with sweet. 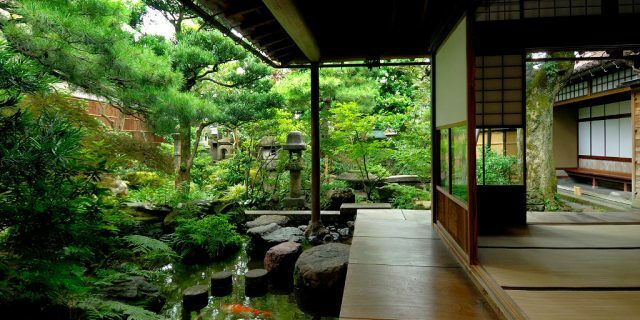 Reservations can be made early, but payment must be made at least three days before the event to the Kanazawa Tourist Association. Which districts participate changes by date. 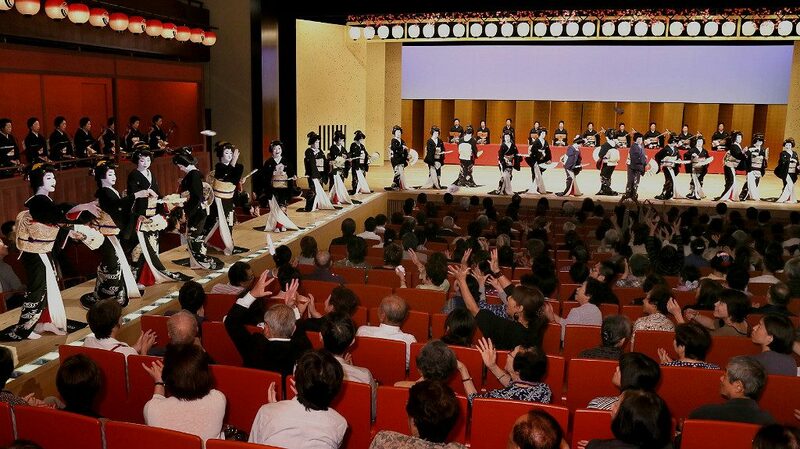 During select days throughout the months of October through March, geisha from each of Kanazawa’s tea districts take turns on the stage at the Kanazawa Music Hall (a.k.a. the Ongakudou) near the station. This is the cheapest ticket to see geisha perform live. One performance a month also includes a tour of the staging facility. Reservations are strongly encouraged, but walk-ins are welcome pending availability. English text and audio assistance is available. Kikumi ranks highly for its dining and drinking experiences, but beyond the exquisite set course meals, Kikumi also offers a unique experience among Kanazawa restaurants. 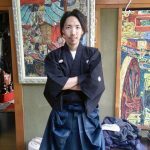 With advance reservation and payment, guests can schedule a geiko performance and interaction with their meal at the bar counter. Kikumi is 250 meters from Kaname Inn Tatemachi. 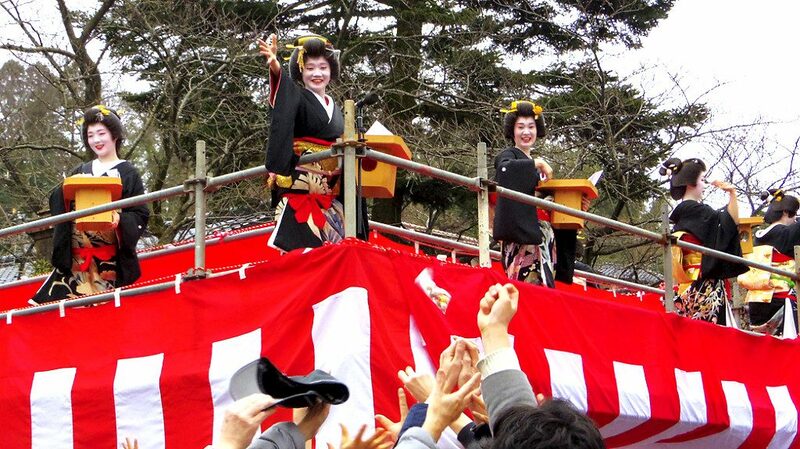 A couple of times in the year, geiko spend time with the public outdoors for special seasonal events. The bean-throwing festival known as Setsubun is an ancient holiday that welcomes the coming year with several activities meant to ensure good luck. Beans, a symbol of purity in Shinto belief, help cast away evil spirits. These are often first obtained at shrines, where they are thrown to an eager crowds of families on the day of Setsubun, February 3rd. At Utasu-jinja Shrine, the geiko from the neighboring Higashi Chaya district do these honors. 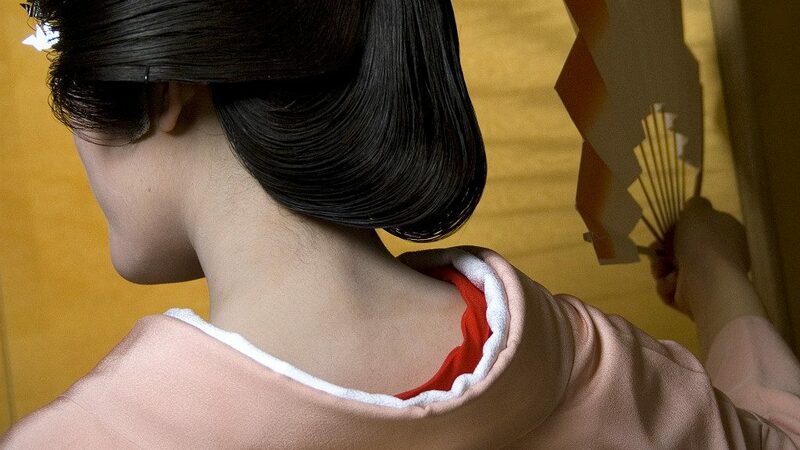 Adorned in black with dried rice in their hair, the geiko approach the shrine one at a time. After a celebratory dance, they spread across an extended elevated stage to reach the massive crowd that has gathered to share the New Year’s blessing of dried beans. A wisteria-clad geiko serves sake to the public along with chocolates from her district’s newly opened shop. At the end of Golden Week, the late spring series of holidays, the geiko of Nishi Chaya come out in full dress to serve sake to the public. Translating roughly as “Sake of Good Manners,” Furumai Sake is served gratis as an expression of good will and a blessing of luck for all. The event starts early with a morning market for local produce. Sake serving starts around 11:30 and continues for several hours. Additional Shinto festivities continue the following day at the nearby Kasuga Shrine. During a September weekend close to Silver Week, geiko from all three tea districts come together to perform on stage for the “Kanazawa Odori.” The grand event celebrates the geiko’s history in Kanazawa and the preserved traditions of their unique Kaga style, and includes large group dances as well as smaller ensemble pieces. The event runs for four days, with twice-a-day performances for eight performances total. Seating prices range from 6,000 to 10,000 yen. 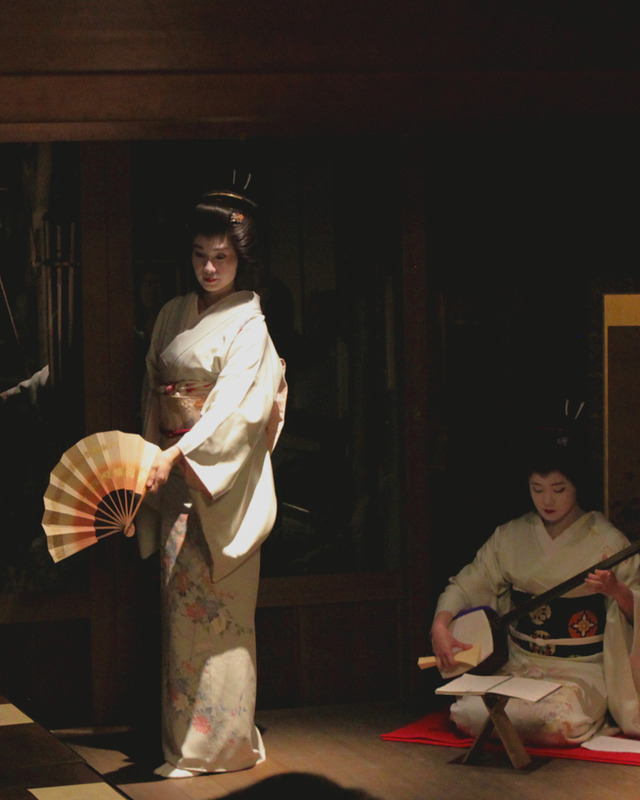 Some geiko perform for smaller audiences during an evening meal. Tickets for these dining and dancing events range from 12,000 to 15,000 yen. For updated prices and booking information, please check their official website (Japanese only). 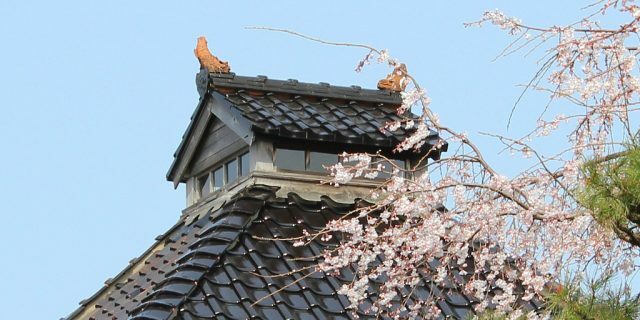 Kaname Inn Tatemachi is only 900 meters from Nishi Chaya and 2 km from Kazue-machi and Higashi Chaya. Our staff will be happy to help arrange any reservations for hotel and hostel guests.